If it ain’t broke, don’t fix it. We’re sure you’ve heard it before, but in this book and in our teaching we take issue with the old cliché, especially in light of the sport we play, where success is defined by breaking things. 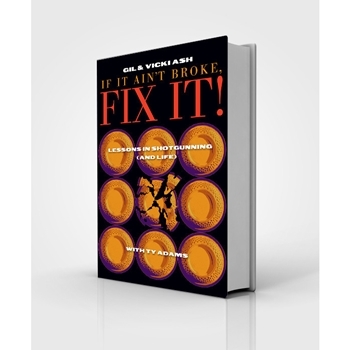 So to us, “If it ain’t broke don’t fix it,” sounds like a recipe for mediocrity. Great things have never been achieved because someone was content with the way things were. Fire burning lamps worked fine to light up a room, but tell Edison he couldn’t do better. Sticking your head out the window and yelling at your neighbor will get their attention, but tell Bell his invention was unnecessary. Do you think Michael Jordan ever sat back and said, “there’s not much more I can do in the game of basketball that Bird or Magic or Dr. J hasn’t already done?” How about Tiger Woods? Do you think that’s his attitude about golf? World champions know that no improvement comes without change, even if they’ve reached a level that is “okay.” They don’t want to be okay, first they want to be good, and then they want to be great, which requires change, or breaking habits that don’t work and replacing them with ones that do and in some instances breaking habits that work and replacing them with ones that work better! Are we saying that everyone who reads this book will be a world champion? No. But if you have the potential to be a world champion, and you live by the theory of “it ain’t broke, don’t fix it,” we guarantee you will never find out. In life, if it ain’t broke, you don’t have to fix it, especially if you’re satisfied with “just okay.” But in sporting clays, your job isn’t done until that target is “broke.” In this game, if it ain’t broke, you gotta fix it.